Same on =IGC= servers, ban deserved. I can only say bb gl hf. You're missing my point, the 'intentional TK' happened on a different server to the HT one, and also happened 2 days ago. This dude has banned me for absolutely no reason. Someone needs to get him some friends or at the very least a beer.. take 5 Bollie and relax, raging that hard can't be good for the heart. i thought you where gone? please go. What a bs topic is this. 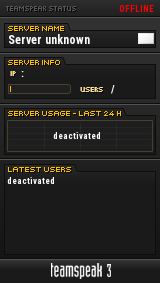 the server belongs to HT, they try to make it as clean as possible, so they take measures. The solution (weeks-ban) might sound overreacted, but you're the bad guy in the story, you started tk people, so you don't have really much choice. When AA dies and you can no longer feed your rage by banning people from a server, where will your obvious rage issue turn? drugs? alcohol? if you rage any more you might hurt someone.. I'm genuinely worried for those around you the next time you die. Get help. Ganja please, I really don't think you know what you're talking about buddy.. I understand you tk someone by accident at the start, it happened to me, its not a problem you say sorry to the tm and you play happy but then tk all the team for things they haven't done to you is just a bs. If you getting kicked it doesn't mean can tk all the team, they want to play its your problem you getting kicked. You rage because you are banned, Bollie did a right thing, because you tked mostly all your team at the beginning for fun as you say so ban is deserved and likely all servers would have done that. We give you a chance, and we happy to let you guys play, just don't be bs and little immature kids, there is a place for kids at the COD ground. I understand you tk someone by accident at the start, it happened to me, its not a problem you say sorry to the tm and you play happy but then tk all the team for things they haven't done for you is just a bs. If you getting kicked it doesn't mean can tk all the team, they want to play its your problem you getting kicked. You rage because you are banned, Bollie did a right thing, because you tked mostly all your team at the beginning for fun as you say so ban is deserved and likely all servers would have done that. Yet another post from someone who wasn't even present. I killed 1 person, that was the person who stupidly ran across the spawn spam on urban, resulting in me being kicked. Anyone who is dumb enough to do that deserves to die. Anyway this is getting blown out of proportion, I started this thread to find out why I was banned and I now know that I might attempt to bring back some old players from EXC (along with krIz) and beat Bollie and his team of admins fair and square in this upcoming cup. But I will no longer be pubbing, peace!! got me kicked anyway... I thought why the hell not hahah! Why the hell not, is it funny to u when u tk? You just made stupid of yourself saying you tked the rest of the team for fun. Edit: I've read the entire thread, this discussion shouldn't really belong to this forum, even if i get why you opened a thread here.